The actual production process takes place in the traditional way; the timber is delivered from the storage area in the river or directly by lorry (1). Cutting and debarking is undertaken in a modern wood room (2). From an intermediate storage facility for pulpwood, the logs are fed into grinders (3). The ground pulp is bleached with hydrogen peroxide to a brightness of around 80% ISO (4). Bleached cellulose is then added to the pulp before it is sent to the paper machine (5). This machine is old, but it has been repeatedly modernised throughout the years. It now has a two-wire system and has been upgraded at the intake section and in the press section. Our total annual production capacity is about 50,000 tons of printing paper, made from wood pulp. The main raw material is spruce, the majority of which is supplied by local forest owners. 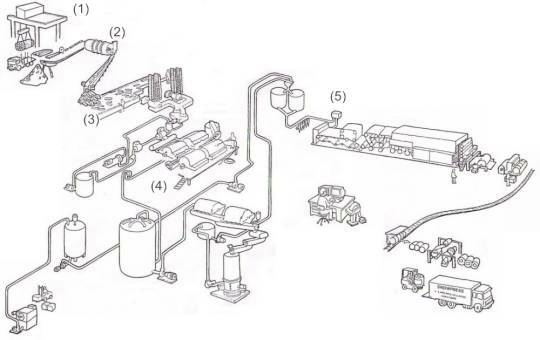 Our paper machine produces paper at a rate of about 600 meters/minute and a width up to 3780 mm.